The Austin College Business Office is located on the first floor of the Caruth Administration Building. Our hours of operation are Monday through Friday, 8:30 a.m. to 5:00 p.m. 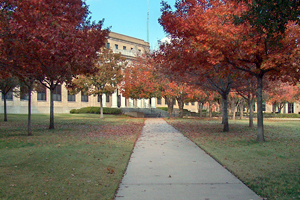 Besides providing the business administration of Austin College, we offer many student services as well. Please contact our office concerning student’s tuition & fees statements and payments, emergency and institutional loans and payments, student loan entrance and exit counseling, 1098-T/1098-E tax forms, accounts payables/receivables, and work-study payroll distribution. Check cashing is available Monday through Friday from 9 a.m. to 3 p.m. Checks may be cashed at the Business Office for up to $200 by showing a valid Austin College I.D. card. A fee of $15 is assessed for any checks returned unpaid by the bank and a “HOLD” will be placed on the student’s record until the returned check is paid. Check cashing privileges will be revoked if more than one check is returned by the bank. In case of unexpected emergencies, students can borrow money from the Business Office through the Brown Memorial Loan Fund. The maximum amount that can be borrowed is $100. The money must be paid back within 30 days from the date the loan is made. Austin College does not charge interest on the borrowed money, but a $5 late fee is assessed if the loan is not fully paid by the date due. Also, a “HOLD” will be placed on a student’s records until the loan is repaid. Students will not be allowed to receive future loans from this fund if previous loan repayments were 10 or more days late. Borrowers are allowed to receive two loans during each of the regular semesters, only one loan during Jan Term, and one during the Summer Term. A valid Austin College I.D. card must be presented at the time of the loan and a student’s financial record must be clear of any “HOLDS”.